It was late October in central Budapest. The afternoon was a little chilly, a little overcast, but not atypical for fall in Carpathian basin. People were already wearing overcoats, and buttoning them. Scarves were stylishly worn, even then, and wool hats covered some heads, as was the style in the mid 1950s. Emboldened by the Polish October, and the students in Szeged who were the first to re-establish the democratic student union in Hungary, Péter Veres, the President of the Hungarian Writer’s Union, led a peaceful gathering at the Bem Statue, where 20,000 students watched a wreath being laid in support of the pro-revolution Polish movement. They listened to him read the manifesto, the list of demands against the Soviets and the communist rule. And then someone cut the soviet arms from the Hungarian flag leaving a gaping hole in the fabric. The crowd started to stir, followed suit, cheering, chanting revolutionary songs and the banned Petőfi Sándor poem that had inspired another Hungarian revolution over 100 years earlier. By early evening, students, revolutionaries, writers, and others started to cross the bridges to the square. The numbers crested 200,000. They marched toward Parliament. A statue of Stalin was toppled and demolished down to his boots, in which the crowd filled with Hungarian flags. At that same time that night, students stormed the Radio building to have their demands read, but instead were detained by the State Security Police. When the crowd demanded their release, they were released, but subsequently fired upon from gunners hidden in the building. Tear gas was everywhere, it drafted across the Danube and into the hills of Buda. The revolutionaries had enough. They began firing back. 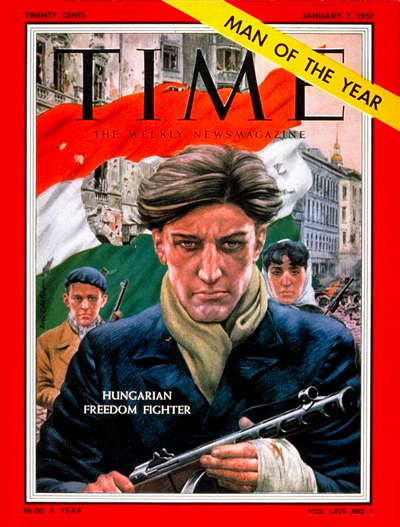 The freedom fighters formed militias, overtook Soviet tanks, threw molotov cocktails, killed soviet soldiers and soviet-sympathizing Hungarians. The communist-installed Secretary Ernő Gerő was forced to escape to the Soviet Union as Parliament came under attack. Imre Nagy became Prime Minister. It seemed, for ten days, that the Soviets had actually been forced out of Hungary, that having been pushed just a little bit too far, the little guy actually stood up and took something back. Charles Wheeler of the BBC even arrived with his crew to make a short movie of this remarkable feat. They took interviews from confident Hungarians in defiance of the Soviets and the Warsaw Pact. Of course, as they left to go back to London, the Soviet Army was already powering toward Hungary. Surveys were taken, statistics were plotted onto graphs, recommendations were formed among the international community. Eisenhower hadn’t fully realized his doctrine yet, and agreed with the other military brass in doing, well, nothing. So on November 4th, Soviet troops came rolling in from Soroksári u. (in the south) and Váci u. (in the north). The city had been split in half, and soon would be back under communist rule. Early in the morning, from the free radio, Imre Nagy made a final plea to the international community (in Hungarian and English) for help, as the Soviets were attacking the city. Three hours later, the radio went silent. Close to a quarter million Hungarians fled Hungary, while thousands of others were imprisoned, executed, or sent to the Soviet Union. I am not a historian, though I find this story to be a compelling one. I grew up in the town that has this in the city center, after all. But this is a story that’s easy to retell from an American perspective. Americans grow up with an ingrained mythology that condemns communism and espouses the pro-revolutionary tales. And yes, many agree that the Hungarian revolution of 1956 was the beginning of the collapse of the Soviet Union. And yes, it’s full of the kind of mythos that is familiar to Americans. Living here, however, 52 years since that time, I find that it’s a little bit more sticky than the American version X of the story. A lot happened between 1956 and 1989. A lot of people happened, involved or uninvolved, activist or apathetic. And in an attempt to avoid making assessments of this story, or my trip yesterday to Memorial Park, with the American gaze, I’m going to break this post in two and try to recount the day with the most plainly objective view that I can. Hopefully, this will serve as a small background for those of you unfamiliar, which will make Part II tomorrow, and my trip to Memorial Park, a little easier to understand. This is an excellent post. It combines good storytelling with an important message: it isn’t easy to be free. Here in the USA we pretty much take that for granted. Not so many other places around the world. Consider what is happening today in Georgia. I was thinking the same thing, in terms of relevance. And really I don’t have much of any reference point, other than the historical perspective. But I think that being here, a little closer to it, or a little closer to those years, at least gives me the perspective that I really don’t know much. And of course want to do my best to learn as much as possible. This is my favorite post / historical account / work of yours that I have ever read. I think Dad hit the nail on the head about what is going on right now in Georgia. Forget about their oil wealth or the strategic significance of their pipelines for one minute and just consider that that Georgia is a tiny nation, who supports NATO, who sent over 2,000 troops to Iraq to help fight our “war on terrorism”, who strives to model itself after American democratic ideals, and our nations response is for G.W. to tell Bob Costas on air at the Olympics that he is mad at Putin. This is crazy. Make sure you are collecting all the primary resources for me as you can on the Hugarian Revolution while you are their. Maybe one day I will write my doctorate on it!